The Eterna Dimmable 105Va Transformer finished in grey is compatible with and Ideal for most light fixtures. It comes pre wired and ready to install, with a range of features to protect your hardware out of the box. It did the job lovely. We have a transformer that we need to replace (Eterna model JQ-ET70N 20-70VA) Would this be a suitable replacement? 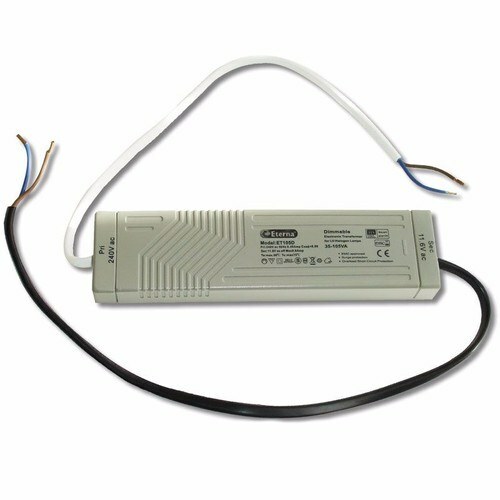 Is this a replacement for a (Ring) Model DET-65 Dimmable Electronic Transformer Input AC 240V Output AC 12V. Pri: 240v ~ 50Hz 65 VA max Cose=0.99 Sec: 12V eff; Tc 55c; Ta 40c. This supplys three (3) Halogen lights in my bathroom. Thanks best regards Steve.